We data scientists love to create exciting data visualizations and insightful statistical models. However, before we get to that point, usually much effort goes into obtaining, scrubbing, and exploring the required data. The command line, although invented decades ago, is an amazing environment for performing such data science tasks. By combining small, yet powerful, command-line tools you can quickly explore your data and hack together prototypes. New tools such as GNU Parallel, jq, and Drake allow you to use the command line for today's data challenges. Even if you're already comfortable processing data with, for example, R or Python, being able to also leverage the power of the command line can make you a more efficient data scientist. Creating data visualizations and statistical models. Whether you're entirely new to the command line or already dreaming in shell scripts, by the end of this webcast you will have a solid understanding of how to leverage the power of the command line for your next data science project. 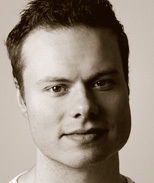 Jeroen is a Senior Data Scientist at YPlan in New York City. He has an M.Sc. in Artificial Intelligence and a Ph.D. in Machine Learning. He is authoring a book titled "Data Science at the Command Line", which will be published by O'Reilly in summer 2014. Jeroen enjoys biking the Brooklyn Bridge, building tools, and eating stroopwafels.